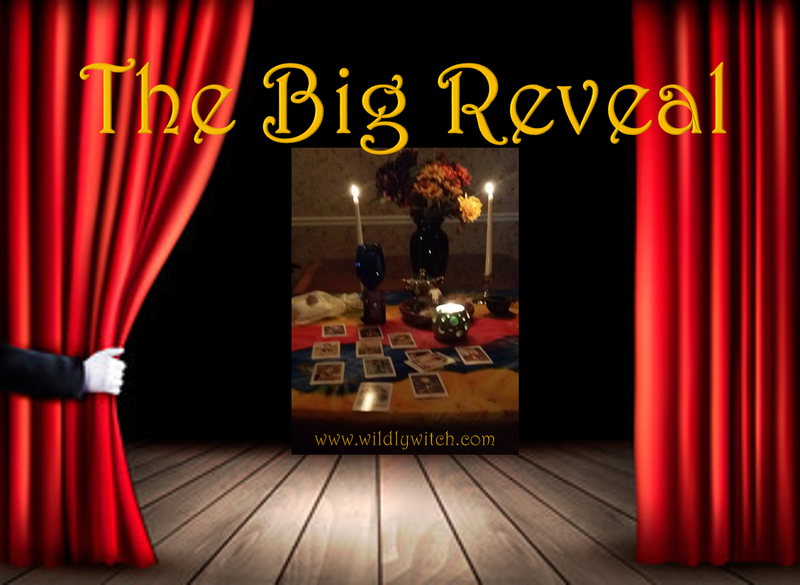 It's Tarot Tuesday, Wildlings! Let's hone our intuitive skills. If you haven't done so already, please go to the FACEBOOK PAGE and choose your card. Then come back here, and check out the Big Reveal! Remember to post a comment on the FACEBOOK PAGE and let's keep track of how we're doing! The presence of the Three of Swords suggests significant pain in your life. This pain is likely caused by or the result of conflict, perhaps due to disrupted partnership or friendship. This pain may be part of a new beginning, but you must face your pain honestly to overcome it. In general, this card can point to very deep emotional issues that must be addressed before the querent can move on. Denying pain does not make it go away (any more than denying a broken leg makes it heal.) However, attention must be paid to balance here also as it must be paid with the 2 of Swords. Allow yourself to experience the pain, but do not wallow in it. It's not healthy to stay in this state for long. However, you must be the one to decide when enough is enough. Seek counseling if you need to. Your mental and emotional health is as important as your physical well-being. Take good care of you. The world needs your special gifts that only you bring to us. The 9 of Pentacles points to happiness and success. This is on both the mundane and the inner realms. You will have a great deal about which to be hopeful and grateful. Expect the best to happen. You'll be in the position to help those less fortunate than yourself. Pay attention not only to your material abundance but also to your spirituality. 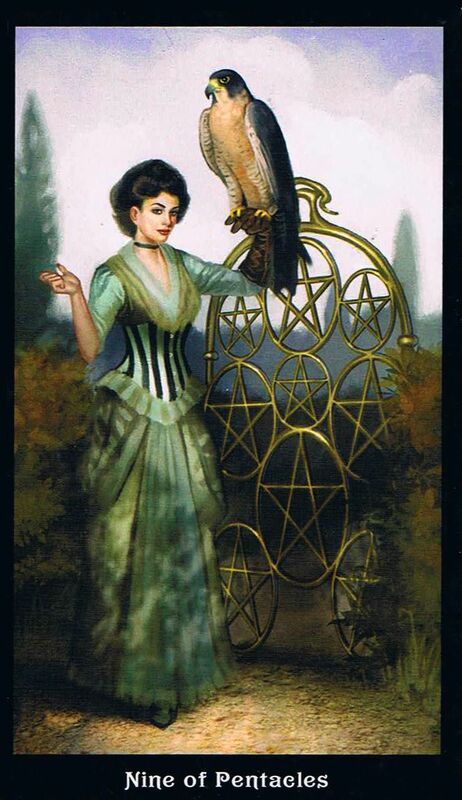 If you're looking for a position, the 9 of Pentacles could well point to a better job coming your way than you would have thought possible. Even if you're currently employed, expect a change for the better, both in terms of your circumstances and your pay. You are likely to be feeling a great deal of spiritual peace and happiness. Your self-esteem is possibly higher than it has ever been, which is a very good thing. You are in the position now to mentor others, and to share the spiritual insights that you have accumulated. Spread the word, and share your happiness! Page cards represent a fresh, demanding challenge to your position in the world. 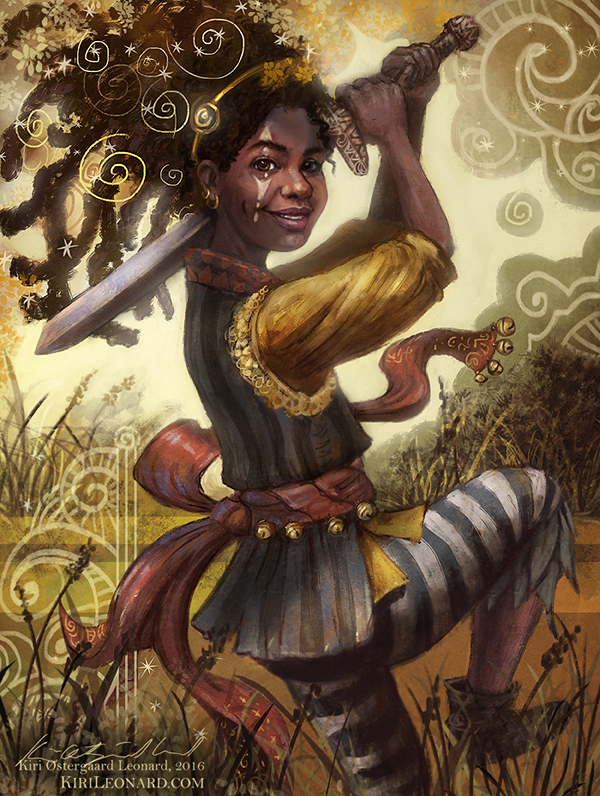 The Page of Swords exists to remind you that your integrity is the sharpest weapon in your arsenal. No matter how experienced you are in the world, from time to time, problems arise that are truly novel situations. When your policy is sticking to the truth, these conundrums are simple to resolve. When the Page comes up in relation to health matters, chances are good that you have been overdoing it, working too hard, behaving too intensely. Give yourself and the others around you a break, your frayed nerves demand it. Silence and rest works wonders. If you've started a new workout regime, don't push yourself too hard. You may have been ignoring your spiritual side. Explore spiritual belief systems that interest you. Open your mind. If you think it's already open, go deeper. The Page of Swords is also all about communication, information and ideas. 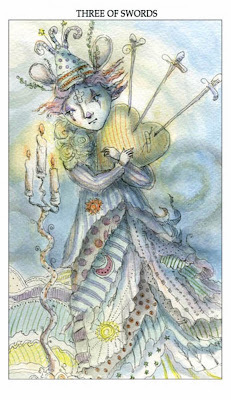 This card is an indication that you need to appreciate and communicate ideas, information and theories. You are always coming up with something new and then finding someone to share it with. You also have a way with words, being a good writer or speaker, and you are passionate about what you are doing. However, be careful that you do not engage in gossip. While this Page loves to talk and to be ‘in the know’, it is important that you use this talent to benefit others, rather than to create negativity. You may also want to be careful about what you say to whom, as you may be more prone to sharing confidential information about yourself. So, protect your privacy. And you may need to first ground your thoughts, before speaking, in order to ensure that you do not later regret what you have said. 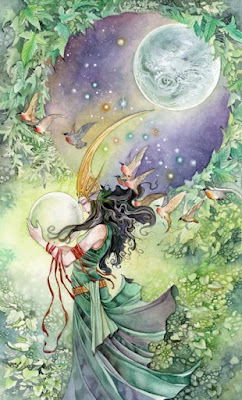 In a general context, The World Tarot card signifies having the world at your feet! This can be in a literal sense as The World is one of the Travel cards of the Major Arcana. It can represent new worlds opening up for you so you can expect to be welcomed by the people in the countries to which you travel. The World can also mean you will have the world at your feet in another sense, i.e. that you will be successful and the opportunities available to you at the moment are endless. 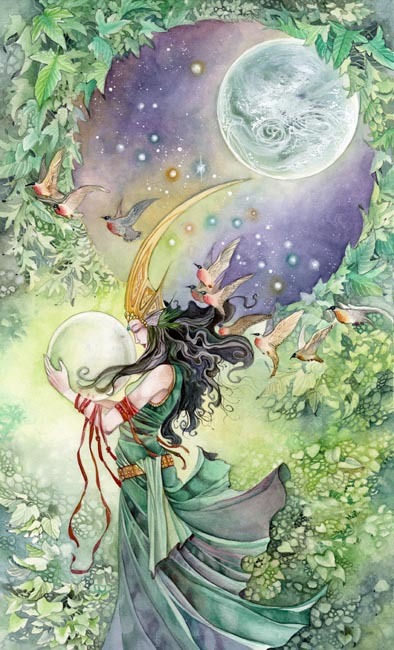 You have gone through the trials and tribulations of the rest of the Major Arcana, you have endured the hardships and learned your lessons and now you will reap the rewards. You should be proud of what you have achieved, it has not been easy to get here but you’ve done it. The universe is smiling upon you and luck is on your side when this Major Arcana card appears in your reading so grab the opportunities available to you. The World can represent the completion of a challenge such as a university course or a project; or it can represent finally achieving a dream or aspiration such as starting your own business, getting married or having children. You have reached the point where you can be happy with what you have accomplished. Success can bring a whole new set of challenges or worries so make sure you’re not carrying the weight of the world on your shoulders. You’ve worked hard to get to this point so stop and savor the moment! Celebrate your accomplishments. How did you do? Are you finding these exercises helpful? Are you struggling with your intuition? How can I better assist you? All of the best conversations are on the Facebook Page. If you'd prefer to speak to me personally, feel free to use the feedback form on the right side of the page. I look forward to hearing from you!